The Smithsonian Institution is the world’s largest museum, education, and research complex, with 19 museums and the National Zoo—shaping the future by preserving our heritage, discovering new knowledge, and sharing our resources with the world. The Institution was founded in 1846 with funds from the Englishman James Smithson (1765–1829) according to his wishes “under the name of the Smithsonian Institution, an establishment for the increase and diffusion of knowledge.” We continue to honor this mission and invite you to join us in our quest. The increase and diffusion of knowledge—across the spectrum of human inquiry. Learn about our beginning with James Smithson’s bequest to the people of the United States. 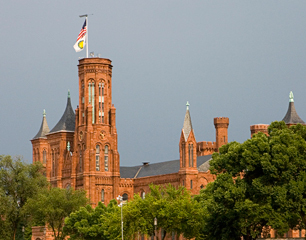 The Smithsonian is home to 19 museums and galleries and the National Zoo. The Smithsonian is one of the world’s foremost research centers in science, the arts, and the humanities. Education is at the core of our mission, from informal education opportunities for all to lesson plans and professional development for teachers. Our collections represent our nation's rich heritage, art from across the globe, and the immense diversity of the natural and cultural world. The Smithsonian is a global organization actively involved in conserving biodiversity, priceless art, and much more. For more Smithsonian numbers visit the Smithsonian Metrics Dashboard. The Secretary of the Smithsonian hosts a new roundtable series on some of the big issues facing America.